Students trying out the new fitness center. A student picks up weights in the new fitness center. The entrance to the new location of the athletic training center. For the next two years, athletes will make the trek to the corner of Summer and Arch streets in order to see Emerson’s athletic trainers. The athletic training room—along with the entirety of the Fitness Center and Cabaret theater—has moved from the basement of Little Building to a new structure located in the middle of Downtown Crossing. First-time visitors can both look and feel suspicious as they slip into a singular door in the cement building between Saint Anthony’s Shrine and restaurant Uno Due Go; the only sign of collegiate purpose is the Emerson College wordmark logo on the front of the door and the tap-in box beside it. The temporary closure of the Little Building from 2017–2019 for renovation was announced in 2014. All facilities located in the dormitory, including the campus’ only dining hall, were originally set to move at the start of construction this May. Then, in July, the athletic and fitness staff was informed that the move would begin earlier, in the beginning of the calendar year and spring semester. “It was a shock,” Mandy Nicoles, the head athletic trainer, said. To make the situation even more stressful for the already-scrambling training staff, it wasn’t until October that the school announced a place to put the Fitness Center, Cabaret, and athletic training room. However, Nicoles said she and her staff are incredibly grateful for the interim location. “We wound up getting way more than I ever expected, which is awesome,” Nicoles said. They have a larger space for the athletic training room, as well a new storage closet and office for the first time in Nicoles’ seven years at Emerson. “I have no complaints,” Nicoles said. 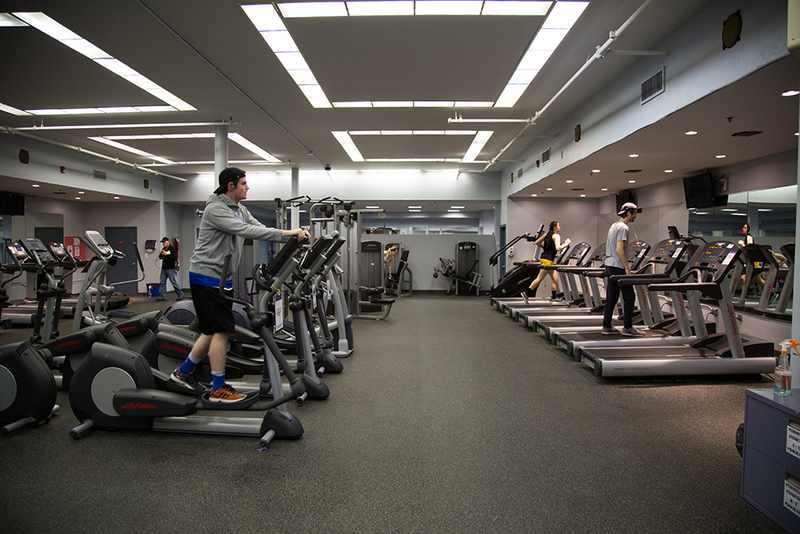 The Emerson athletics training staff began to move into the location on Jan. 6. Rather than unpacking boxes for the brand-new office, they have been focused almost entirely on setting up the athletic training room. The trainers wanted the room to be ready when spring semester sports pick up. “Once we get into the spring season, things are just going,” Nicoles said. With two full-time athletic trainers and one part-time trainer, the athletic department is going to have to take things one day at a time as they search for another trainer to hire. It’s hard to keep the facility open when the trainers need to be at multiple sporting events at one time. Thus, the athletic facility will see many random hours, because it must always be monitored by a trainer. Nicoles did say that it will open between 10 a.m. and 11 a.m. each day. For the athletes that need specific attention, scheduling seems to be the key for the new facility. “It’s going to be a lot more communication and really just trying to figure things out [with both the coaches and athletes],” Nicoles said. Among the students, however, there was a small sense of doubt expressed upon the debut of the facility. In the beginning of the spring semester, athletes had nowhere to work out, so several purchased memberships at local gyms the first week. Freshman volleyball player Brendan Lynch said that since Emerson didn’t have a fitness center open at the beginning of the semester, he and other athletes got memberships at nearby public gyms like Planet Fitness. “But now that our gym is open, it is private and free,” Lynch said. Lynch, a visual media arts major, added that the single elevator in the four-floor facility, coupled with the approximately ten-minute walk to the fitness center from campus, has stifled some excitement, but not enough to make players continue using public gyms. Nicoles said this is the reaction to the facilities she was expecting. Nicoles estimates that Emerson students will take this walk for approximately two more years before the permanent Fitness Center, athletic training room, and Cabaret open in the Little Building. Nicoles believes that athletes will, after this semester, become fully accustomed to the stroll.